Does he look like a guy that could beat me in a race? C'mon, who is more ballin'? Honestly, he looks like death swarmed over him. Again, no number showing, his main MO. Sad. Please note the usual shades, long black pants, hat, and absence of visible bib, the weird looking down and the walking. 17:33? I don't think so. Pics (Bib 641): Zero, nada, zéro picture. The pictures that show up are from a different guy. Pic 2 (possibly? ): white/orange hat, different sunglasses, black pants, yellow jacket, HRM monitor – Is this the same guy? Wow, the pic comparison is a killer! Awesome, GK. Sorry Florida Oldtimer. I am 44 and don't have clue as to how to do that. I wish I could help. Maybe one of those young whipper snappers can help. Sorry. Bandana hides the hair. Very Krippy, I mean tricky. All part of the disguise. 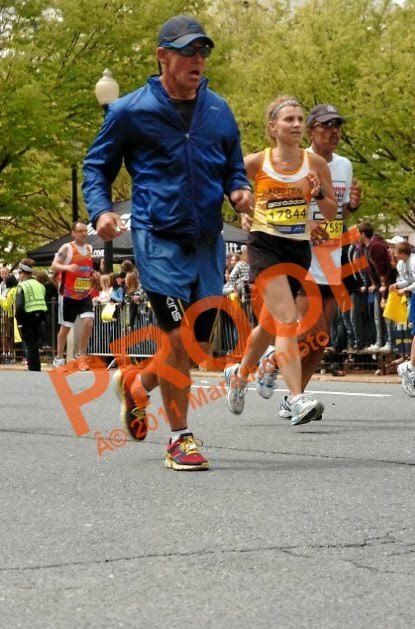 Which event is this one from - the 15K or the Marathon? I just can't STOP. Picture #6 from the lost & found. Follow the link, clink on "ON-COURSE: View Male Runners (26761)". Page 211. Middle, 2nd from the bottom. Outfit #2 (shorts, compression socks, black logo shirt, etc..). Bib looks partially obscurred. Good find. I think that's new. Another pic: ON-COURSE: View Male Runners (26761). Page 108, left, 2nd from bottom. Outfit #2. 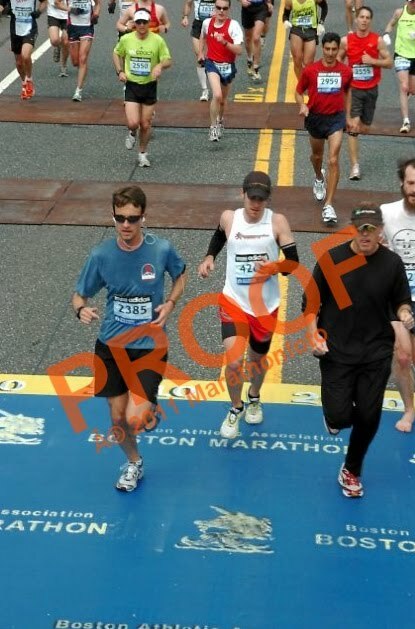 Does anyone know at what approximate point along the Boston Marathon course the JIM RHODES photo was taken? The blue and gold street logos are around the 10 mile mark just before entering Natick just after passing between two bodies of water on either side. I'm pretty certain of this having run Boston twice in the past three years. Guys, we are getting somewhere. But we are losing focus from the key strange behavior : the delayed start. This has got to figure in to the trick somehow. I agree that biking segments makes sense, but there is no need for a delayed start in order to play tricks with bikes. The common belief is that the delayed start is used to ensure that nobody pays any attention to him. He creates the illusion that he's just another harmless slow jogger in an attempt to run under the radar. Lets face it, not too many 7 hour marathoners get called out for cheating, and he's trying to blend in with them at the start. It's not until the race is over, and participants begin looking at the chip times that they begin to ask, "Who is this Kip Litton Guy. And why didn't I see him?" However, if Kip started at the front he'd be lining up shoulder to shoulder with those he theoretically is competing against, which is something you don't want to do if you want to go unnoticed as you slip on and off a course.